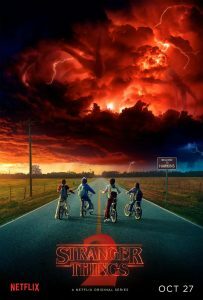 Without spoiling any part of Stranger Things Season Two, as I even went into my binge without watching the trailer, I’m going to give you 11 reasons why you should be watching this brilliant show. And if you haven’t seen Season One, perhaps these will give you some impetus to go back and binge from the beginning. This is a safe zone, no spoilers ahead! This isn’t a spoiler, it’s something we’re starting to get “spoiled” with when it comes to shows that we can binge. But just like Season One, once you get to a certain point in the nine-episode run of Season Two, it is incredibly hard to just stop watching. It’s written that way, but there doesn’t seem to be any other way to write it. All cliffhangers mean in the shows that we binge is that we’re more likely to keep watching… And with Season Two, as with Season One, the episodes are kinda like Pringles… Once you pop, you just can’t stop. I thoroughly enjoyed the natural progression to be made from the D&D playing of Season One to the “hanging out at the arcade” in Season Two, especially given the time period of the show. It’s a small detail, as they could have gone back to the dice, but seeing Dragon’s Lair was just plain geek out level fun. While there are a few new faces in Season Two and they’re all great, the two new big names joining the cast were Sean Astin and Paul Reiser just as Matthew Modine was the big name in Season One. Reiser is playing the least neurotic character I’ve ever seen him play, and was much better than I expected, but the middle aged Astin is a bit jarring… I mean he’s Rudy… He’s Samwise… He’s eternally young in my brain, but he’s a damn fine actor and even manages to steal a few scenes. It’s really hard to have a favorite character on this show in my opinion, but for some reason Dustin gets more of the great lines than the rest and this one to the librarian is tops. “I am on a curiosity voyage and I need my paddles to travel. These books, these books are my paddles…” I can’t say anything more, or it could be construed as a spoiler. 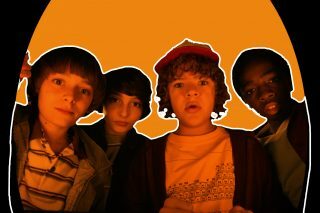 But out of context, it’s still brilliant and of course is a line for the enigmatic Gaten Matarazzo. I ask only one thing of computer graphics in anything and that is to not take me out of the thing I am watching. These graphics are relatively seamless. They’re well done and they fit, it’s that simple. The Score and the Soundtrack are both equally brilliant. The score by Kyle Dixon and Michael Stein is worth listening to on it’s own, but the soundtrack steals the music cues of Season Two. It seems like they had a bigger budget than with Season One, they spent a lot of that money on song rights and it was money very well spent. The new characters are well introduced and the old characters all get growth. Character development is often lost to the plot development, but not in this show. Even the relationships have their ebbs and flows and ultimate growths. I’m not saying this is shocking, but this series is predicated on four friends and an amazing plot, so it is nice to see they didn’t forget that these characters wouldn’t be exactly the same people who we last saw in Season One. Those wonderful characters are framed in an artistic way. It’s not a fancy shot for a fancy shot’s sake, but it isn’t just a steadicam and “Action!” either. This show, and Season Two in particular, has some of the best shot scenes I have seen on television in a long time. I’m not kidding. It’s not spoilery, but there just aren’t enough people talking about the fact that one of the underlying themes within this show is that everyone in their own right is a badass. The geeks, the jocks, the popular kids, and it doesn’t stop at youth, everyone in this show displays a courage that makes badass work with almost every character regardless of race, creed, color, age or gender. There’s an after show! Well, this isn’t breaking news, as there are plenty of after shows. But for a show you’ve just binged to have seven twenty-ish minute episodes with behind the scenes discussion with the creators, directors, and actors, it is a great way to come down from the journey that you’ve just taken. I look forward to more of these from Netflix in the future. And there’s more to come… The Duffer Brothers, in various recent interviews and on a recent episode of The Nerdist Podcast have said they are working on Season Three of The Stranger Things. Additionally, they have stated they could go as far as a Season Four or Five, but they don’t want to bleed it completely dry. They want it to end on a high note. I applaud them and look forward to as much Stranger Things as they have to give.